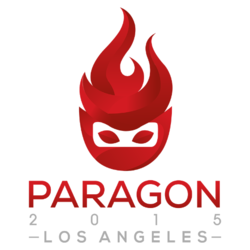 Paragon Los Angeles 2015, or simply Paragon LA 2015, was the second edition of the Paragon tournament series, a national tournament which took place on September 5th to 6th, 2015, at the Ontario Convention Center in Los Angeles, California. The event was held by Versus and Gaming Knights, featuring singles for Super Smash Bros. Melee and Super Smash Bros. for Wii U and singles and doubles for Project M, with live streams by VGBootCamp, Versus and Project M Central. Paragon LA currently stands as one of the largest Smash tournaments to date and the second largest Project M tournament to date, with 405 entrants. Due to unforeseen circumstances, the doubles tournaments for Melee and Smash Wii U were canceled. Despite being allowed to progress, Project M doubles was unable to be completed before the end of the tournament, ending in a forced split between the six remaining teams. These players were DQed in Round 1 of Top 64. Due to time constraints, the top 6 teams were forced to split. ↑ Unofficial Doubles cancellation announcement. D'ron "D1" Maingrette, Paragon LA commentator. Retrieved on 2015-09-06. This page was last edited on November 15, 2018, at 21:54.